In one short month, my baby brother will be getting married. He has been “Uncle Garret” for so long, it’s going to be hard to get used to the idea that he isn’t just the fun-loving punching bag for my boys anymore. 🙂 I suppose it was time for him to finally grow up and start his own family. (By the way, I can GUARANTEE that my mom is already crying right now. 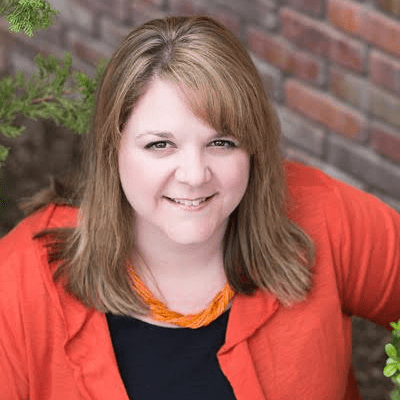 She’s only one paragraph into this post and she’s blubbering. Bet you anything.) My parents are now officially empty-nesters and it’s going to take some getting used to for all of us! 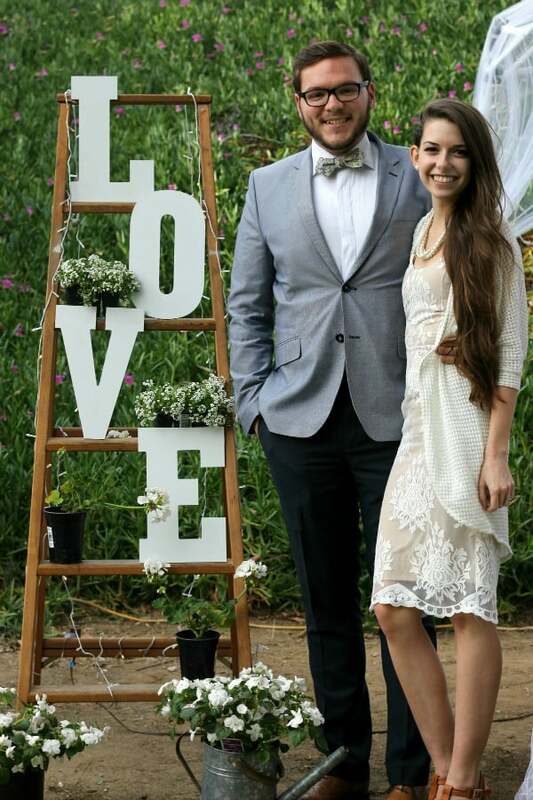 Garret and Anna are getting married in South Carolina and will be living there while Anna finishes her last two years of art school. Because the wedding is so far away from all of our friends and local family, my parents hosted a “pre” wedding reception on their property to celebrate the upcoming marriage. 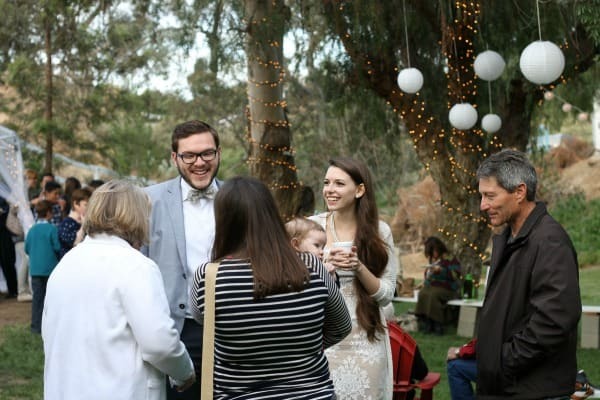 The property looked so beautiful, and if you knew my mom, you’d KNOW she didn’t spend a fortune on wedding reception decorations. 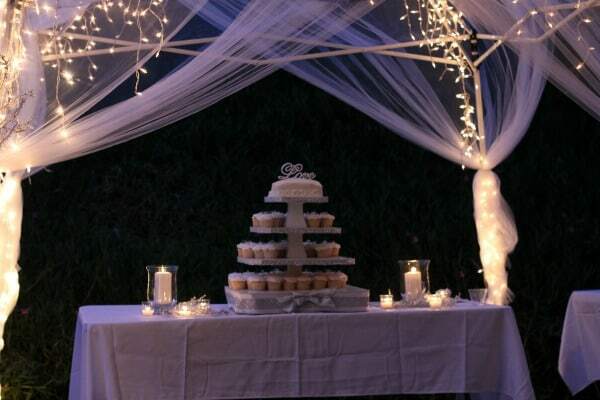 The cake table was the centerpiece of the yard. Everything was very simple-white and touches of silver glittery accents were the only colors. 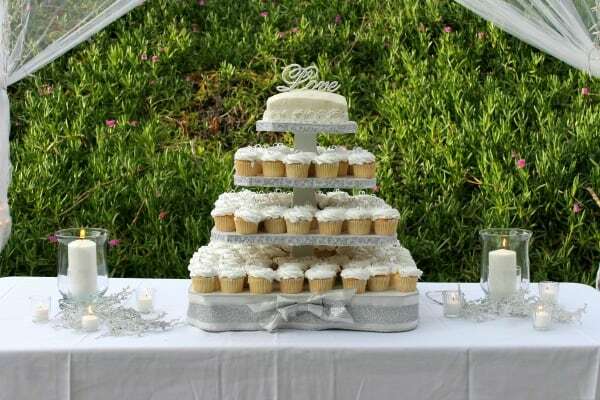 The table was covered with a white cloth and only held the cupcake stand and some candles with a few glittery branches. My dad is a wood worker so he built the cupcake stand and then my mom wrapped the edges in white and silver ribbon. 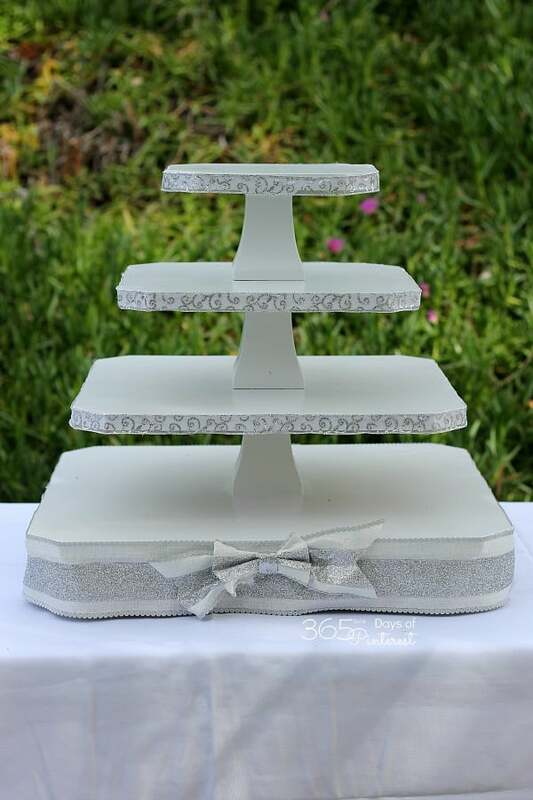 We added little silver rings to the tops of the cupcakes (ordered from Sam’s Club-totally worth it) and baked and frosted a square 8″ cake with white frosting for the top. 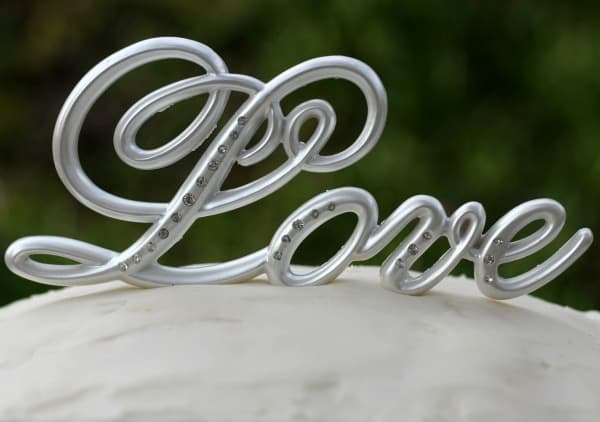 The “Love” cake topper was the perfect finishing touch. 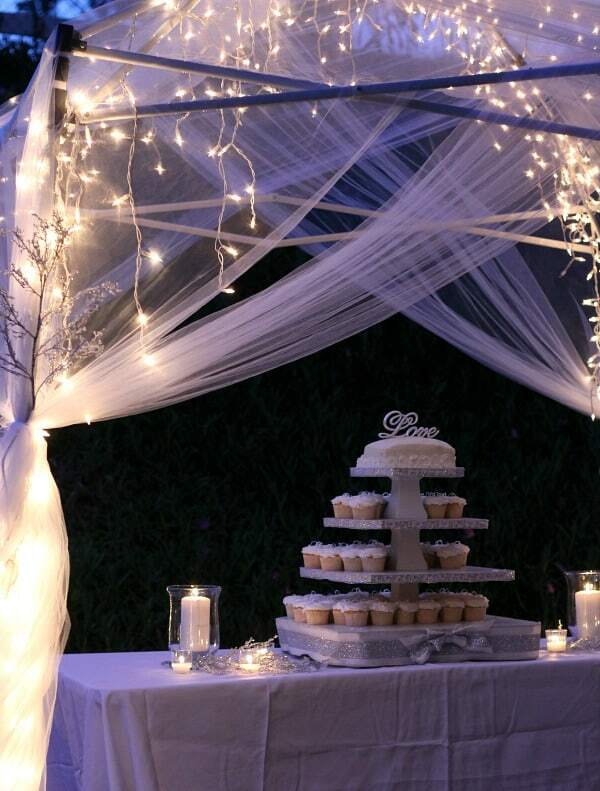 The cake table was set up under a “gazebo” of sorts. It was just a simple pop-up with the shade cover removed. It was draped with white tulle and lights with a few of the sparkly branches on the legs. As it got dark, it looked so pretty! 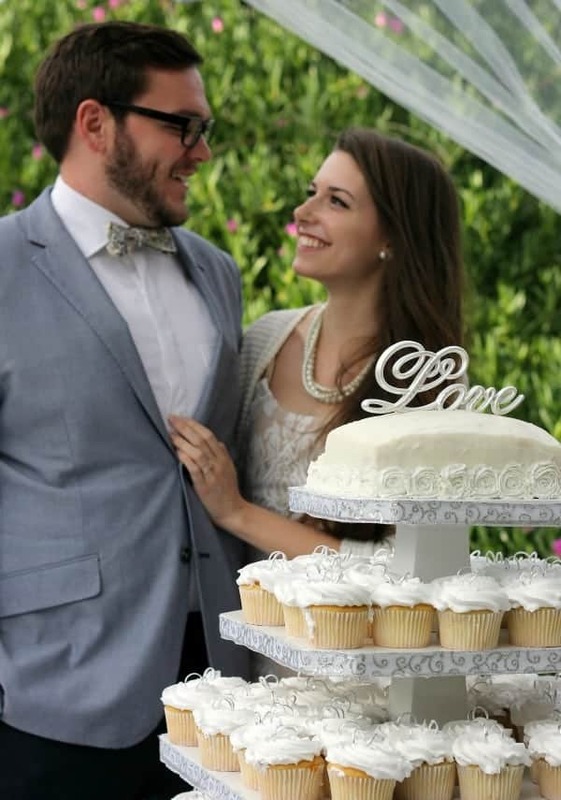 Next to the cake table was a simple wooden ladder with white letters spelling LOVE and a few simple white flowers on the rungs. It also had lights running up the sides for when the sun went down. You can also see the simple bench seating for guests made out of a piece of wood painted white and cinder blocks. 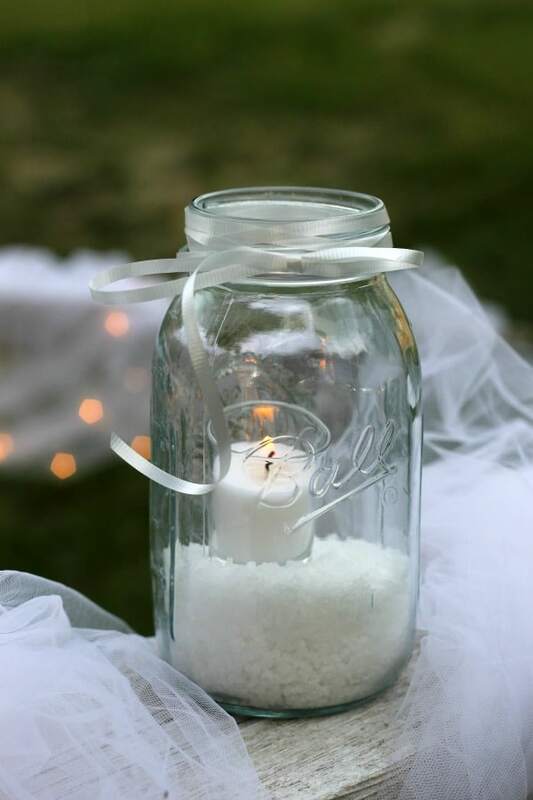 To mark off the area and add light, we filled easily over 100 mason jars with candles and Solar Salt (affiliate link) tied off with a simple white ribbon. 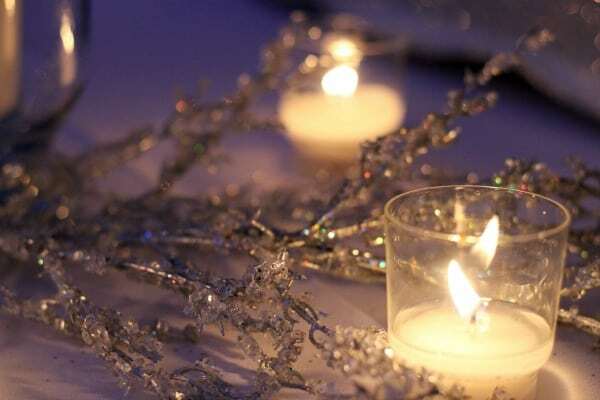 As the sun went down the candles flickered and rows of light created a festive atmosphere. 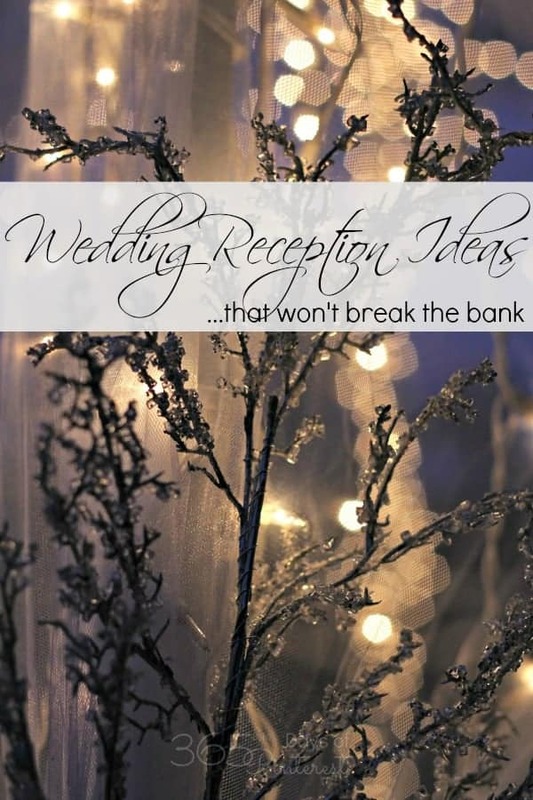 It was such a pretty wedding reception and there’s no way you would have thought it was cheap or even frugal. I think it all came together so well. What do you think? just gorgeous!!! These are all fabulous ideas! 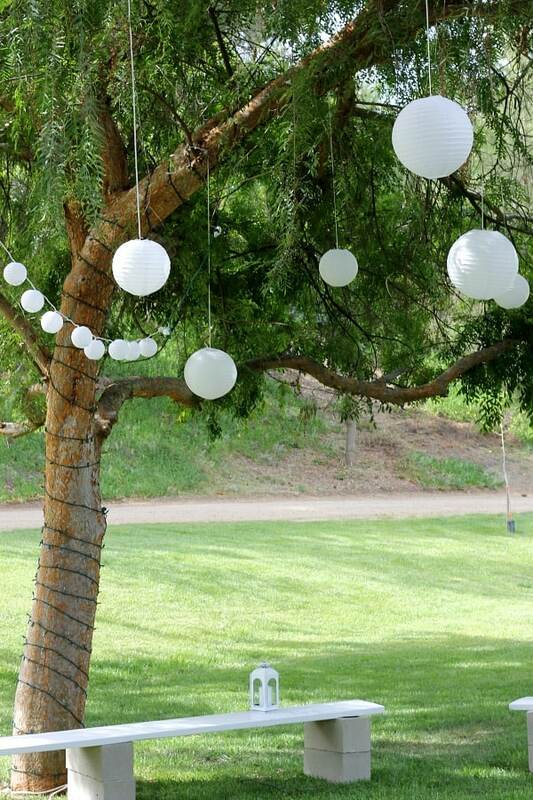 Beautiful decorations. I know it’s a happy, but sad time for your family. Anna is such a pretty girl. It will be hard for your mom to have them so far away, but it may not be for long. In a couple of years they will probably come back to Temecula. Are you all going to North Carolina for the wedding? Congratulations Garrett. NICE! !Such clever ideas too! Does the solar salt glow in the dark, or what is it for. I also love the clever bench idea. Your Mom is one resourceful lady! Before you even said anything I knew my First Lady would be crying (only I can call her that BTW). It looked beautiful I now know where you get all your ideas from.